Wind Mill Slatwall Products specializes in custom slatwall and retail display panels. Manufactured with our exclusive Anchor™ Core custom panels include a variety of options including surface finishes, groove & edge treatments and more. Wind Mill’s expert Project Managers will work one-on-one with you to ensure your custom projects meet the necessary specifications. The Brick Series includes Brickyard™ and Brickwall™ providing rich texture and color to create an authentic brick appearance. Subway Tile is functional slatwall that delivers a subway tile look. For a natural expression, Construction Series products can be painted or stained resulting in a rustic or industrial-like appearance offering a rich and inviting retail environment. Adding a touch of elegance with a decorative vertical groove, CUBEwall™ Series products creates interest and unlimited choices with unique pattern options. DASHwall™ Series products are made to your specification for dash length and spacing. This creates an elegant appearance for unlimited merchandizing options. The Designer Series awaits for your input to build the panel or product of your dreams. Using images and logos, The Graphic Series HPL delivers unique & captivating panels that grab the attention of customers. High Pressure Laminates (HPL) are available in infinite colors and textures, from all major brands, creating endless possibilities. 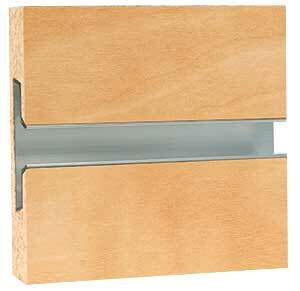 Metal Series slatwall profile sections interlock to form uninterrupted walls or display areas. PVC Series slatwall is strong and durable. With its lightweight nature, PVC slatwall is easy to handle and install. Anchor™ Core by Boise Cascade Wind Mill Slatwall Products is an exclusive manufacturer of retail display panels using Anchor™ Core. Anchor™ Core is 50% stronger than MDF. Its growing popularity is based on its increased weight carrying capacity. Medium Density Fiberboard (MDF) Medium density fiberboard is an engineered wood product. It is made by breaking down hardwood or softwood residuals into wood fibers, combining it with wax and a resin binder to form panels. MDF is the mainstay core used for retail display panels. However, when more board strength is required, Anchor™ Core is recommended. NAUF (No Added Urea Formaldehyde) NAUF refers to the type of resin used as a bonding agent. It is part of a large family of chemical compounds called volatile organic compounds (VOC). This means the compounds vaporize becoming gas at normal room temperatures. Businesses supporting sustainable practices will often use NAUF products. NAUF is available in limited sizes and requires extended lead times. 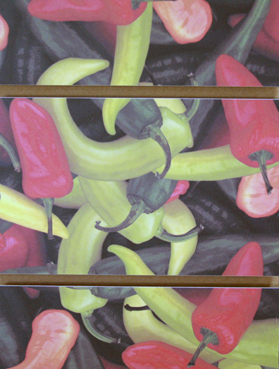 Flame retardant (Class A) MDF Core can be combined with fire rated plastic laminate by Formica™ or Wilsonart™. This will satisfy most local fire codes requiring a flame or fire retardant slatwall panel. Flame retardant (Class A) MDF is available in limited sizes and requires extended lead times. Always check local fire codes prior to purchasing flame retardant MDF. Standard slatwall panels are 48”H x 96”L. This panel size is the most cost efficient and is also the most available panel. However, when projects require a custom solution, Wind Mill excels at offering an impressive array of options, from creative designs, unique finishes, and manufacturing capabilities. Wind Mill produces retail display panels in a variety of other common sizes which can be machined with a half groove on the edges for stacking. Wind Mill’s slatwall can machine-cut grooves in either direction on a panel. On center refers to the distance between the center of the grooves. Grove treatments are an essential part of great slatwall designs. Wind Mill Slatwall Products has you covered with the largest selection of Slatwall groove treatments in the U.S. Treatments can be as simple as a painted grove or as sophisticated as a custom color powder coat painted aluminum insert. Other options include PVC strips and inserts, available in five standard colors. Standard finish options for aluminum inserts include milled aluminum or white and black powder coat paint. Custom colors are virtually limitless to meet your specification and aesthetic design. Aluminum inserts add great strength to slatwall. Wind Mill offers 4 standard grove profiles with inserts to fit all. 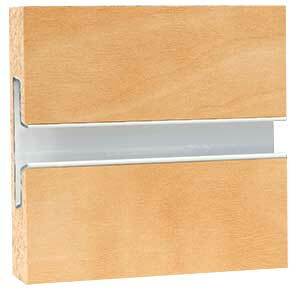 We even offer a generic insert that fits the most common slatwall on the market. * View our slatwall strength comparison chart for more information. The plastic strips come in the five colors shown above (red, white, almond, gray, and black), slatwall plastic strips fit the back of the groove as a decorative accent. These strips come in 130” rolls to cover one 3” on-center. Slatwall Plastic Strips are least expensive treatment for covering the grooves. Wind Mill uses water based paints, and can paint grooves to match, or accent a Slatwall panel. 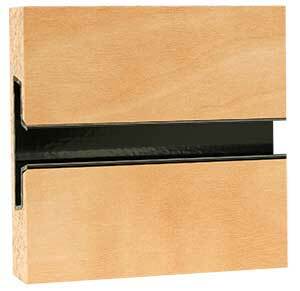 2 half grooves - puts a half groove on the edges of the Slatwall panel for stacking purposes.The standard Slatwall panels come with half grooves on the top and bottom of the panels. This puts the seam between the panels at the back of the groove where they meet together. 1 half groove- puts a square edge on one side of the panel, and a half groove on the other for stacking purposes. 0 half grooves- leaves a square edge on the top and bottom edges of the panel. Splicing Woodgrain laminate (HPL) is done to allow for the woodgrain to travel in the same direction as the grooves on a 48” W x 96” H (grooves in the short direction) panel. Woodgrain laminate always comes as a 4’ x 8’ sheet with the grain running in the long direction.